Theoretically there should be a correlation between the shades of green and the quality of the domains, but how do you get people to click on the good domains? Until today the only incentive people had was to see how many other people clicked on it, but that was already reflected in the color. You also would be able to double check that the domain was still available, but, most of the time that’s going to be true. Adding the number of search results should encourage people to click around. Hopefully, visitors will be curious about how many search results domains have so they’ll click to find out. Since people will click on the ones that seem interesting, those should be the ones that stand out over time. I’ll be the first to admit that the number of Google search results is not a great predictor of quality. For example, when you google ” hackerer “ 333,000,000 results are returned. Seems fantastic until you realize that those are the number of results for “hacker” and not “hackerer”. Google auto-corrects the query and returns the new phrase’s results. I considered checking for this, but it’s is tricky. Consider “ejellyfish”. Google also auto-corrects that, but there are also some legitimate results for eJellyfish. How do you distinguish? In the end I just said screw it, I’ll return whatever it displays. Maybe that was a mistake, hard to say. There’s another obvious problem. “psycholog” will return hits for pages that contain the word “psychology”. I tried to mitigate that by including spaces around the phrases when I googled them, but, that didn’t help ina lot of cases. Regardless, I’m happy with the new featuer. I’m sure there are clever ways to filter the results to find great domains. Maybe the domains that have between 5K and 7K results would generally make great domain names. I’ll let ambitious visitors figure that out. I’m very happy with the way the site looks. 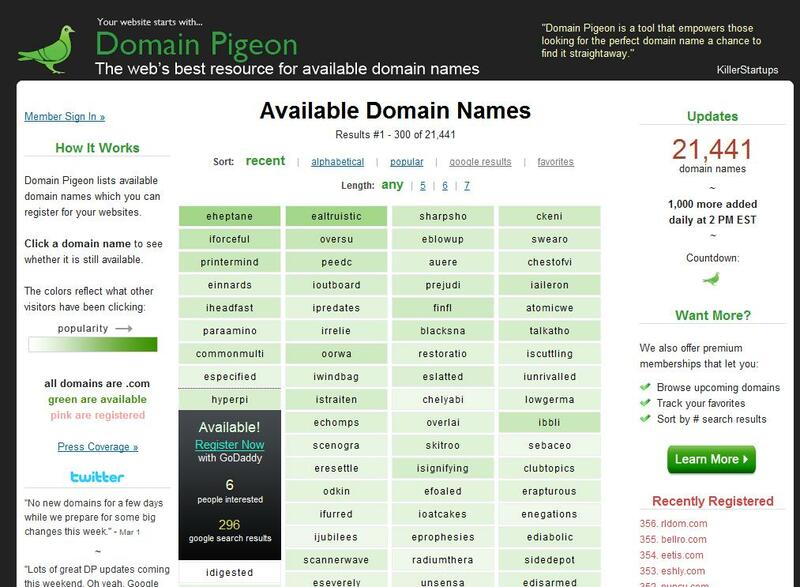 Over the next few days I’m going to completely automate the entire process from searching for available domains to googling to posting on Domain Pigeon. Currently each of those processes is automated but their not tied together. For example, I still have to manually go into Domain Pigeon’s admin area and add new domains. I want to get it to the point where I can leave for say, three weeks, and assuming no power outages or anything like that, Domain Pigeon still gets updated while I’m gone. Posted on March 2, 2009 by Mazur. This entry was posted in Domain Pigeon. Bookmark the permalink.